Well we thought we’d settled on our layout. A while ago we’d talked about having the stove on the port side of the boat, therefore less likelihood of the chimney being knocked off while cruising when coming across situations where you have to move to the right whilst passing other boats, over hanging trees, bridges. I’d put Oleanna’s stove on the starboard side. To move it, all we need to do is flip the boat over, a mirror image. So today the tracing paper plans have been rescanned, noted that they are meant to be back to front and sent on to Julia to forward on to the builders to save time. NB Oleanna will start life at Tim Tyler’s boat yard in Newcastle-under-Lyme and then move to Sheffield to have the shell completed, Phone calls with Julia and Tim suggest that the baseplate will be laid next Monday or Tuesday, confirmation will be later this week. Things are moving fast all of a sudden. Luckily my plans are good enough for the shell to be started, window positions etc whilst the CAD versions are worked on by someone else with the finer detail. They can flip the boat over on CAD easier than me! We may have found a stove that will fit and work for us. 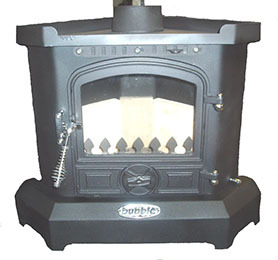 A Bubble Corner Stove with a back boiler can be fitted closer to bulk heads due to it’s wrap around water jacket. It is a corner stove so the flue is central, but the sides hopefully extend far enough to put a kettle or cast iron pot on. I had a go at drawing up a 1:1 scale version on our table. The website gives you all sorts of dimensions, sadly not quite adding up to what appears in the drawings. But taking the smallest dimensions, adding an inch to the flue for a double skin, it is possible to fit our cooking pot on it with only a small overhang. Our only possible drawback is that it appears to have an up stand around it, which would mean getting much smaller pots to cook in and a new kettle. We have asked the questions and wait to hear back from them, Fingers crossed. Research on the composting toilet is on going. Our friends Bridget and Storm have the model we are looking at and have very helpfully sent us photographs of their urine tank and storage for it. A 20 and 25 litre tank are available from the suppliers in England which are 140mm deep plus the screw cap. This may be possible to have under the floor, but the gauge wouldn’t be visible in this position. This entry was posted in Uncategorized on 10th Feb 2016 by pipandmick.